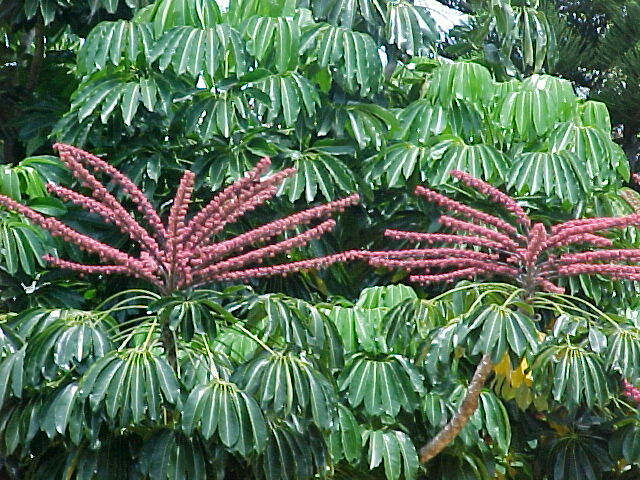 Distribution and habitat: Schefflera actinophylla is native to tropical rainforests and gallery forests in Australia (eastern Queensland and the Northern Territory), New Guinea and Java. It often grows as an epiphyte on other rainforest trees. Description: Schefflera actinophylla is an evergreen tree to 12m (40 feet) tall, with single or multi-stemmed trunks and greenish bark. Leaves alternate with petioles to 61cm (24 inch) long; palmate compound with mostly 7-16 leaflets shiny, light green, oblanceolate, up to 30cm (12 inch) long, with margins entire (or sparsely toothed when young). Flowers 25mm (1 inch) across, borne in dense clusters that form a large, red, showy inflorescence at stem tips above foliage. Fruit a purplish black, round, fleshy drupe to 7mm (0.25 inch) in diameter. 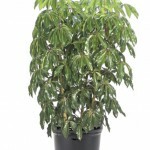 Houseplant care: Schefflera actinophylla is an easy to care plant. This plant will live for many years if it is looked after properly. It is often lack of space – particularly vertical space that brings about its end. If it gets too tall or to get a bushy Schefflera actinophylla plant cut back growth in the autumn. Provide thin stakes for stems where necessary. The main stem will need to be tied to a stake at intervals as it grows taller, although this will be less necessary if growing tips are pinched out regularly. 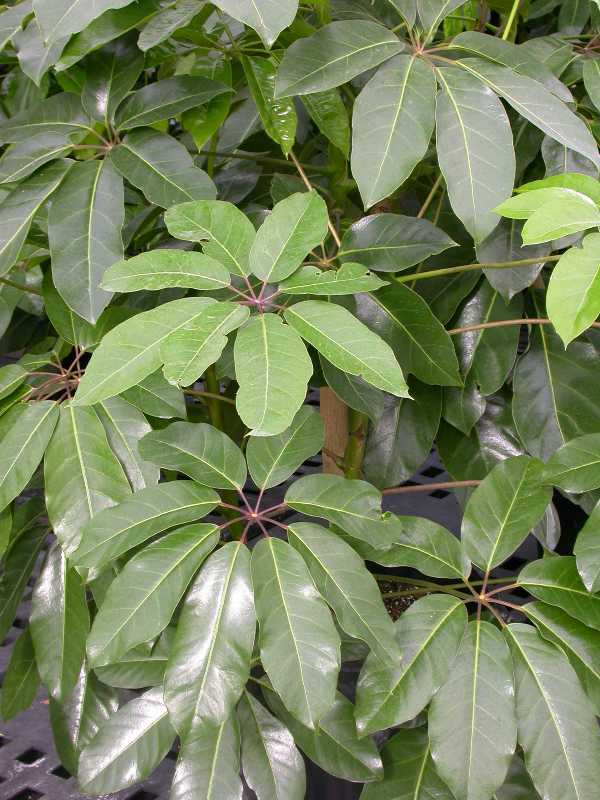 The leaves of Schefflera actinophylla will benefit from being cleaned regularly with a damp sponge. Water: Water plentifully in the summer – once or twice a week – and mist occasionally. In winter, water about once a week and mist every two weeks. Do not let it stand in surplus water – it does not like wet feet. Light: Schefflera actinophylla does well in a brightly-lit position – but it can also tolerate a shady spot. Temperature: In summer, keep at normal room temperatures. It can stand outside, as long as the temperature does not exceed 21°C(70°F). In winter, the temperature should be kept above 12°C (55°F). Fertilising: Feed once a month during the summer with a standard liquid fertilizer. 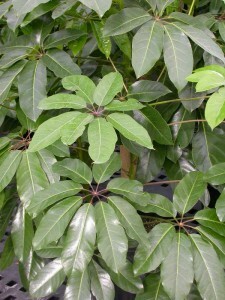 Propagation: Propagate Schefflera actinophylla in spring from tip or stem cuttings 7-10cm (3-4 inch) long. Take each cutting immediately below a leaf node, strip off lower leaves and dip the cut end on the cutting in a hormone rooting powder. Plant the cutting in a 7cm (3 inch) pot containing a moisture equal parts mixture of peat moss and coarse sand or perlite and enclose the whole in a plastic bag or heated propagation case. Maintain temperature of 18-23°C (64-73°F). At lower temperatures these cuttings are likely to rot before they can root. In bright filtered light and steady warmth a cutting should root in three to four weeks. When renewed growth indicates that rooting has occurred, acclimatise the new plant to room conditions over a period of about two weeks by opening the bag or the case a little more every day and water the plant only enough to keep rooting mixture barely moist. When the plant is uncovered, place it in bright lit situation, water moderately and apply standard liquid fertiliser monthly until a fine network of roots appeared on the surface of the potting mixture. This will have occurred by the time two or three new leaves have been produced. Thereafter move the plant into a slightly larger container of soil-based mixture and treat it as recommended for mature Schefflera actinophylla. Potting and repotting: Use a soil based potting mixture. Move the plant into a pot one size larger annually in early spring. After maximum convenient pot size has been reached, plants should be top-dressed annually. Yellow, falling leaves are due to overwatering or leaving the plant pot standing in water. Treatment: Let the pot mixture to dray out a little between waterings and use less water in future. Plants get thin, long and leggy when the temperature is too warm and the plant does not get enough light. Treatment: Move the plant to a cool and brighter spot. Brown scales on leaves and stems are insect attacks. Treatment: Dab with cotton swab dipped in diluted methylated spirit and scrape off with a toothpick. 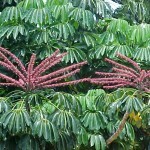 Uses: Schefflera actinophylla is commonly grown in mild to warm climates as a decorative tree in larger gardens and, when mature, it has bright red spikes of flowers with up to 20 racemes which develop in summer or early autumn. With a minimum temperature of 13°C (55°F), juvenile specimens are grown in temperate regions as houseplants. Schefflera actinophylla is said to remove benzene (a carcinogenic substance) from the air. 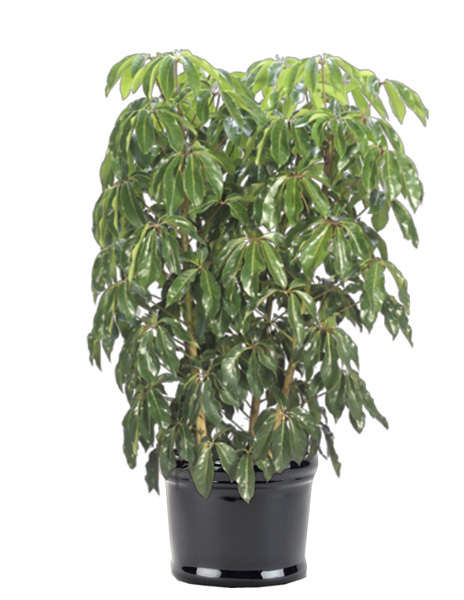 Availability: Schefflera actinophylla is available at all times of the year from nurseries or garden centres.